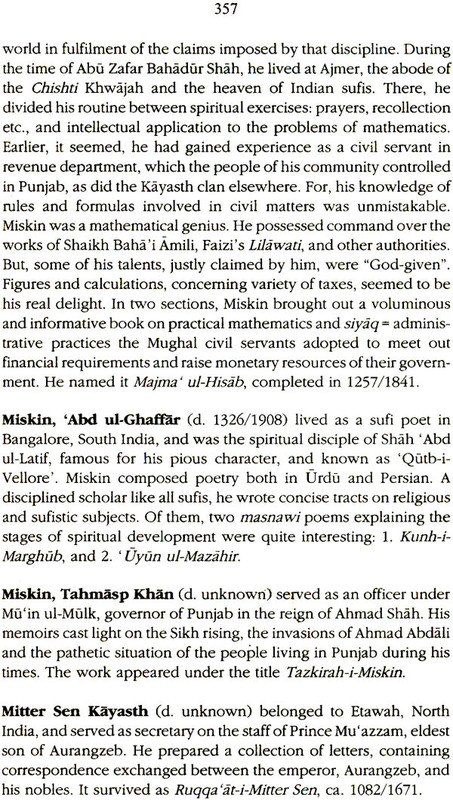 This Dictionary briefly introduces the Persian authors of the Indian sub-continent. Their mastery over diverse fields of knowledge is evident from the range and variety of books produced by them. Their works deal with such varied subjects as sufism, anthology of poets and saints, versions of the Prophet’s traditions and original digests concerning jurisprudence, histories, diaries, memoirs, science, medicine, official bulletins etc. The translations from Sanskrit works on Indian philosophy and science added a unique dimension to this corpus of Indo-Islamic literature. Ethnically different from each other, these authors revealed remarkable uniformity in the exercise of intellectual vigour and curiosity. For a span of nine centuries from Al-Biruni to Iqbal there was a line of brilliant writers sharing In the advancement and responsible for raising the prestige of Persian, and making India a vast crucible of ideas by their collective genius. Quality sustained itself due to a variety of factors, mainly, the patronage and lavishness of ruling classes and high regard in which scholarship was held, as also Persian being the court language of the period. Professor Nabi Hadi, initially graduated in science and later studied law and literature. He started his teaching career in the Muslim University, Aligarh, where he rose to the position of Chairman of the Department of Persian and also acted as Dean, Faculty of Arts. He was associated with the Aligarh University for about four decades. In 1960, he was awarded a research fellowship by the Government of Iran which enabled him to stay as a guest of the University of Tëhran for two years. He was invited twice by the Oriental Institute, Naples, Italy, to participate in its teaching sessions. As a member of the Indian History Congress, he presented papers dealing with medieval India, Iran and West Asia. He has published several books on Mughal poets. As contributor to the Dictionary of Natlona1Biograp1y, he investigated the ethos of India’s freedom movement after his retirement from the Muslim University, Aligarh, in 1991, be now devotes his leisure to reading and writing. it gives me great pleasure to write a Foreword to Prof. Nabi Hadi’s Dictionary of Indo-Persian Literature. The work is an illuminating guidebook on Indo-Islamic Studies. It presents a panorama of creative energies of a large number of people with different backgrounds working together in the Indian sub-continent. The Indira Gandhi National Centre for the Arts has attempted through its several research and publication programmes to place before contemporary audiences material hitherto unknown. The search has not been restricted to a single language, area or an ethnic group. The Centre has focussed on material which underpins the symbiotic relationships and the processes of synthesis rather than insulation. Also, the Centre’s publications have attempted to draw attention to the continued dialogue between India and other civilizations and cultures. The translation and re-publication of “Raffia Legends and Rama Reliefs in Indonesia” by the late Willem Stutterheim was one such attempt and “The Thousand-Armed Avalokitesvara” by Dr. Lokesh Chandra, the second. In the first, the relationships between India and Indonesia were stressed and, in the second, the dialogue between India and several parts of East Asia through a single motif was highlighted. The Centre was proud of publishing Prof. Seyyed Hossein Nasr’s book on “Islamic Art and Spirituality” which covers a very broad spectrum and has a depth of understanding rare and subtle. We were particularly delighted when Prof. Hadi, who had been single-handedly pursuing the subject, graciously offered his manuscript to the Indira Gandhi National Centre for the Arts, for publication. His work is a mine of information to several sources which require earnest work by younger scholars. For the Indira Gandhi National Centre for the Arts, it is a most welcome and rich addition to its publication programme. I am grateful to Prof. Nabi Hadi for not only writing the book, but also for seeing it through the press and to my colleague, Dr. L.M. Gujral, for supervising the production of the book. This Dictionary is meant to accommodate briefly men of learning and intellect who subscribed to the development of Persian literature in the Indian sub-continent. Initially, it may serve as a guide-book to researchers in the field of Indo-Islamic studies. At a glance, they will get acquainted with important personalities and their writings before launching their onward quest. Intelligent readers, interested in Medieval Indian society and culture, should find it equally instructive and easy to consult. As planned here, the information supplied through author-wise entries is deliberately concise; nonetheless, it may prove useful in examining the interaction of ideas well-known for their impact on the mind of human beings inhabiting a vast region of the globe. The sub-continental literature of Persian has the distinction of encompassing almost all categories of knowledge. A large number of authors having emigrated to India found themselves in a new environment where mental stimulation was quite natural. They tried on a variety of topics and to their credit left, for instance, the earliest work of Persian written on sufism, the earliest surviving anthology of poets, biographies of poets and saints, Persian versions of the Prophet’s traditions and original digests concerning jurisprudence, translations from Sanskrit providing access to Indian philosophy and sciences, verbatim record, malfuzat, of the discourses addressed by the sufis, and last but not the least, histories, diaries, memoirs, and official bulletins. Encouragement and patronage available to scholars in India was far more lavish and in the same proportion was the quality of their endeavour. Historically, it has been India’s destiny to be influenced by the spell of foreign languages. Sanskrit was not the language of the common folk; and the utmost care exercised by its privileged speakers in preserving its purity betrays the extraneous character of that language. The only honest Indian to realize this fact was the emperor Ashoka. Persian, that is, one of the two major vehicles of creative expression used by Muslims, the other being Arabic, was introduced into the sub-continent, together with the religion of Islam, by the humble-looking sufis, who gained popularity due to their unworldly and pious character. Had there been no Turkish invasions, Islam with its attendant paraphernalia was bound to have permeated the enormous area of land stretched from Khaibar and Bolan passes to the shores of the Indian Ocean. The earliest wandering scholar and saint, who turned towards India and wrote a book on Islamic sufism, the first of its category in Persian language, was Shaikh Ali b. Usman Huwiri, whom the people of Punjab respectfully call Dãtã Ganj Bakhsh, buried in Lahore (ca. 465/1072). Since the time of Muhammad b. Qasim (ca. 97/711), many audacious Muslims, who faced difficulties in their country of origin due to religious or other controversies, and whom their society was not prepared to tolerate, for example, the sect of the Khawãrij, found welcome refuge in India, where they established pockets of their existence and survivaL Adversities not unlike those of the Khawãrij were experienced about three centuries afterwards by the Ismailis and some of them, following the footprints of their predecessors, crossed over to India from the Islamic mainland. Their strongholds and settlements could be spotted in Sind and Punjab long after the control of the area had passed onto the successors of Sultan Mahmud of Ghaznah. Scanty notice has been taken of that parallel process of peaceful mobility made available to themselves by the Muslims independent of their triumphant armies. Sultan Mahmud of Ghaznah (d. 422/1030) left a line of successors and his eight descendants were allowed by their suzerains, the Seljuqs of Iran, to retain their rule over parts of Afghanistan and North India: Sind and Punjab down to Lahore. The Ghaznawid princes were active patrons of art and literature; and during their time many Persian-speaking families settled in the cities of Uchchah, Multan, Lahore, and the areas adjoining them. After about one and a half century, Sultan Muhammad b. Sam Ghuri, a member of the Shansabani dynasty, displaced the Ghaznawids (582/1189) and made Delhi the permanent centre of Turkish Empire. As a significant event, Persian was adopted for the purpose of administration and government (588/1192). Its use as official language of the empire continued undisturbed during the following centuries till it was abolished by the British East India Company; and English language occupied its place, 1253/1837. About the role played by the rulers of Medieval India and their subjects, in promoting the cause of Persian, the statement of Ibn Batutah may give some idea. The Moorish traveller, voyaging in the Indian Ocean and the Pacific, was impressed by two facts. The sea- routes upto Shanghai were safe from the attack of pirates, who feared the Sultan of Delhi. And secondly, Persian language was understood as far away as the court of the emperor of China. (a) Temporary visitors, most eminent among them was Al-Biruni; the rest were poets who marched in the company of Sultan Mahmud. Accounts left by them may be gleaned out from their laudatory poems. (b) Permanent settlers: Safi ud-Din Gazruni (d. 398/1007) was the sufi disciple of his uncle, Shaikh Abu Ishaq Gazruni. He witnessed the time of Sultan Mahmud, and according to popular legend, was the founder of the city of Uchchah, Sind. Shaikh Ali b. Usman Hujwiri (d. ca. 465/1072) settled in Lahore and was the authorof Kashf-uI-Mahjub. Mas’ud-i-Sa’d-i-Sajman (d. 525/1130) did not settle voluntarily. Just, about 20 years of his life were spent as royal prisoner in Punjab; and most of his poems bear the stamp of India. 2. The dynasty of Ghür was represented by Muhammad b. Sam Ghuri alone. He made Delhi the permanent seat of the empire. Imãm Fakhr ud-Din Razi visited India in his company. The author, Fakhr-iMudabbir, was granted audience by that Sultan. MU’in ud-Din Chishti of Ajmer arrived prior to his conquest, and soon thereafter, entered Bahã ud-Din Zakariya of Multan. 3. The slaves ruled a little less than a century. Aufi and Minhãj-i-Sirãj strike as the outstanding personalities of their period. 4. The Khaljis survived for a shorter span. Nonetheless, the age of the Khaljis was significant for men like Amir Khusraw and Shaikh Nizãm ud-Din Auliya. 5. The Tughluq dynasty culminated in the break up of the empire due to the whimsical policies of Sultan Muhammad b. TUhlUq. Important men of the period were Badr-i-Chach, the poet, Shaikh Nasir ud-Din MahmUd Chiragh-i-Dehli, the sufi, Ziya-i-Barani, the historian, and Ziya-i-Nakhshabi, the scholar possessing knowledge of Sanskrit. Insult upon injury was the invasion of Timur, 801/1398, which opened the way for the mushrooming of regional dynasties. However, the courts of Gujrat, Malwah, Bidar and Gulbargah, Jaunpur, Bengal, and Kashmir, were points of gravitation for men of letters, where they obtained lavish patronage offered by local rulers. 6. The Saiyeds and 7. the Lodi Afghans retained precarious control of Delhi symbolizing the central authority. Those who adorned their age in various fields of learning were Miyan Bhowa, Jamali Dehiawi, and Rizq ullah Mushtaqi. 8. 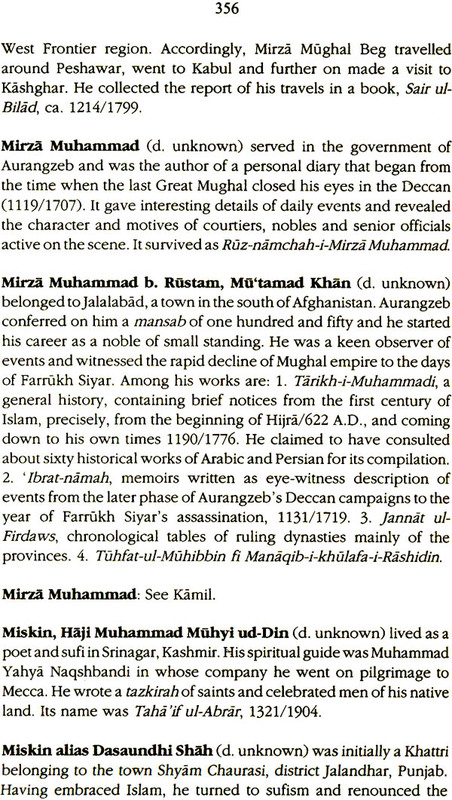 The Mughals, a misnomer invented by the Indo-British historians, were the descendants of TimUr. BãbUr pitched the dynasty after removing Sultan Ibrãhim Lodi (933/1526). Their period coincided with the Safawis of Iran and the Usmanis (Ottomans) of Turkey. Significantly the men and women of Mughal royalty were gifted writers and poets; and all of them possessed refined taste. Reward and patronage apart. The Mughal court attained the prestige and fame of a sort of academy. Hence, every talented spirit from Iran and Central Asia deemed it essential to attend it. The number of those who flocked to the India of the Mughals, in fact, defies enumeration. Nor were the indigenous elements lacking in vigour of mind and command of diverse disciplines. Competition led to the raising of quality and the Mughal era left memorable record of cultural excellence. India’s Persian has been distinct from the Persian of mainland Iran: many factors determined its character. First, it was owned as common legacy by many races: Iranians, Turks, Afghans, Tajiks, Arabs, and Indians, both India-born Musalmans and the Hindus. All of them running the empire, pooled their energy to the formation of its idioms, vocabulary, and accent. Other particulars, responsible for its discernible identity, were environment, geography, social conditions and human experiences, which combined to mould its independent style, and also, intonation, till it emerged as the Persian of the sub-continent. Oddly enough, the Indianization of Persian did not warm the hearts of Iranians traditionally sensitive in regard to the purity of their language. They developed reservations which in course of time mellowed into prejudices. Some justification may be advanced in defence of their indifference to the corpus of literature produced in India. For example, none of the five great poets, so much respected by the sub-continental people: Amir Khusraw, Faizi, Bedil, Ghalib, and Iqbal, were Iranians by race, and so on. Indian Persian, when it was in use, covered the area larger than Iran, and the number of people communicating in it and employing it for a variety of needs must be equal, more or less, to those who spoke it as mother tongue. The last of the eight Musalman dynasties, that is, the Mughals, came down from Babur, originally a Timurid prince of Farghanah, Central Asia. The boundaries of their empire surrounded larger portions of present day Afghanistan. They treated Kabul, Qandhar, and Balkh as their ancestral seats and maintained intimate relationship with the people of those places. In given circumstances, the Afghan and Tajik expressions, both in speech and writing, fixed their stamps on the Persian of the Indian sub-continent. It had affinity with them, or to be sure, with the tongue of old Rudaki, in phonetic modulations and word selection. Friends, who helped me as I proceeded with this work, were Muhammad Wasim Khan Sherwani and Shihabud-Din Ansari of Jamia Millia Islamia, New Delhi, S. Akhtar Husain Kãzimi ofJawaharlal Nehru University, Noor Mohammadãn of Iran Culture House, New Delhi, Rahim Reza, his wife Luciana Reza, and my friend Professor Francesco Bosso‘s son, Bruno of Italy, always ready at my summoning with his footballer’s promptness. In Aligarh Muslim University, where I passed almost all my teaching career, there were colleagues whose company was a constant source of inspiration. Also, I must thank the gracious lady, Dr. Kapila Vatsyayan, a keen scholar of Indian art and culture, who accepted this book for publication in the series of Indira Gandhi National Centre for the Arts. Dr. Lalit Mohan Gujral, Consultant, Indira Gandhi National Centre for the Arts, applied his experience and scholarship in making the manuscript press-worthy; and Mr: Shakti Malik, Proprietor, M/s Abhinav Publications, undertook the botheration of its printing. I am indebted to both of them.